Well, the time has come. I just ordered a set of Avons for my stock wheels. I have been reading about the dwindling choices for rears and now I have to deal with it first hand. In reading about the conversion, it seams that finding a machinist to do the work is going to be difficult. I started to wonder if anyone has tried modifying or replacing the caliper mount instead. I think there is plenty of room to "move things around" to fit. Anyone looked into this option yet? I dont have the background on the other option, but I did not find it that hard to find a machinist to do the work. the difficulty might be in the "how much" category. If you have the OEM bags, I highly recommend that you machine the wheel to move the rotor and caliper inboard, otherwise the caliper will be very close or even in contact with the bag. Since the bags tend to move around in motion, so this could lead to the brake dragging and/ or the bag wearing through. Machining the wheel not only allows the use of the OEM caliper mount but insures there is adequate clearance between the caliper and bag. I used the Mean Streak rotor without machining the wheel and made my own caliper mount, but I have aftermarket luggage that leaves plenty of clearance. As for finding some to do the work, the machining can be done on any mill or lathe with enough capacity. Google "wheel machining services" to see if you can find someone in your area. I think Jan Trento used a Meanstreak rear caliper and modified the caliper mount but those posts would have been lost with the meltdown. IIRC you had to remove 1/4" from the mount to get it to fit and then work out a caliper bracket stay (he modified the swingarm and bolted it the same as a Meanstreak, I think) but I couldn't say for sure that there was no wheel machining. I bought a wheel and caliper from him a LONG time ago but ended up having the wheel machined and used a Nomad rotor after a friend volunteered to do the machining for free. I will be doing the front 17" swap in a couple of weeks when I need new tires and THEN I can try out the new PR4 GT's I bought over the winter. Thanks for the input. I know about the proceedure that's been posted here. I was just looking for an alternative solution. I thought i read a post somewhere that it could be done without modifying the wheel. I just cant find it again. 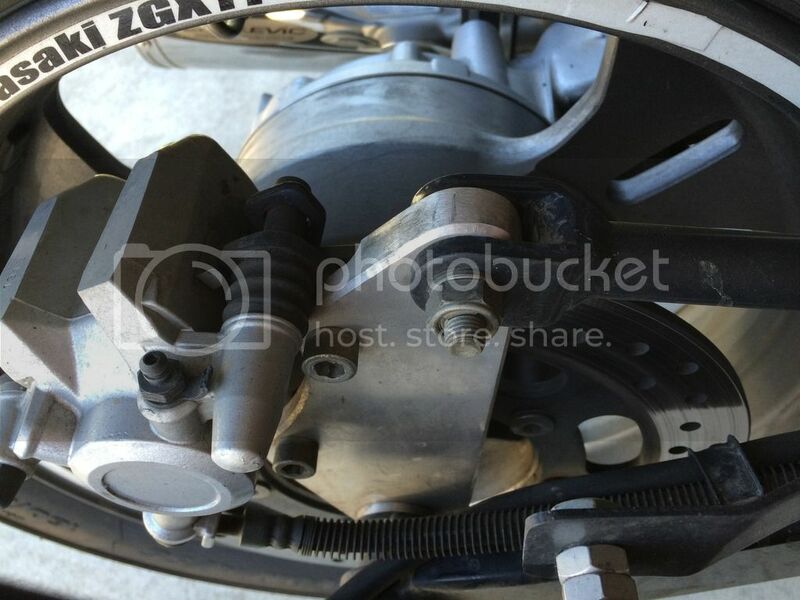 In looking at the stock setup, I can see enough room for the caliper to be repositioned to line up. Just curious about any prior attempts to make it happen. I plan to get the MS wheel and Vulcan rotor anyway and I may do the engineering just for fun. With the new tire in the mail, I have time to play with it. GF-in-CA Thanks for the heads up on the bags. Perhaps spacing the antlers would give back the clearance. I know I should be able to find a shop here in Richmond when I start looking. Sometimes my mind needs to get back figuring stuff out to stay active. If you are in Richmond, consider joining us in Independance VA for the Crossing-The-Lines rally in July! Sport Rider, Thanks for the invite. I will let my friends know and we may make it there. RodWpg, I think you found exactly what I was looking for. It is food for thought when I get the wheel. Actually, it might be two wheels since my brother has my '88 and needs the same mod. The non machined Mean Streak wheel swap was me. I have been riding for a while now with no issues. As far as any interference with the MS caliper and Connie saddle bag..... there is none. The way the right side bag is shaped, there is a cut-out that the MS caliper lines up with (see pictures). I have had ZERO contact with the caliper and saddle bag. 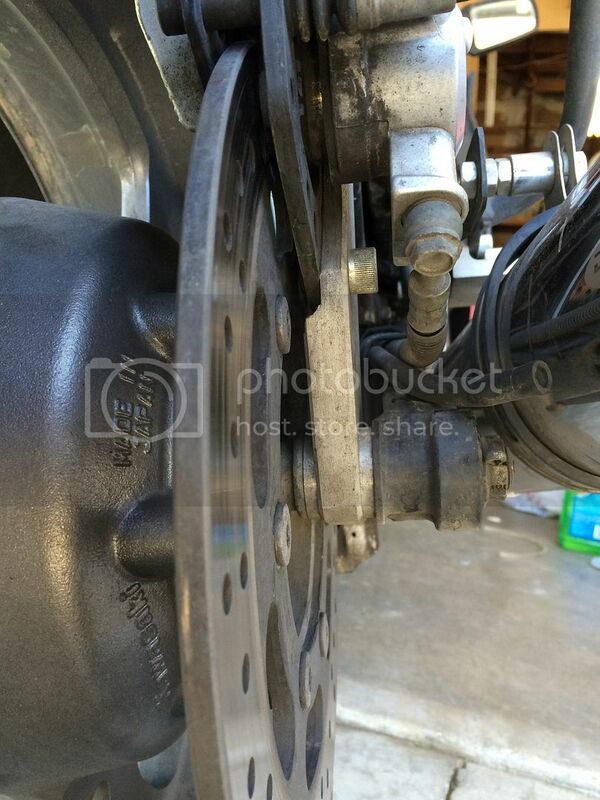 As I have said before, I don't claim this is a better way to mount a MS rear wheel, just a different way. I like your different way Is the Mean Streak caliper any narrower than the C10 caliper? Definately thanks to you TxFatboy for your work to make a "what if" a reality. Your method may not be any different in costs but it may save time by not having to locate a machine shop. A good welder should be able to handle it. Woody can correct me if I'm wrong, but I believe his solution still requires some machining of the Mean Streak caliper bracket to narrow it down. Still easier than machining the wheel though. Gary, the Concours and MS rear calipers are about the same width... just under 4.5 inches. And yes, the MS caliper bracket had to be machined to the same thickness as the Concours caliper bracket. I think the total was 0.180 inches (0.09) from each side. Here are a few pictures of the process and finished (gray caliper bracket). I like the way you used the Mean Streak wheel, but was wondering if it would be possible to fab a brake caliper stay, instead of the tube welded to the swing arm? I am a welder, and I was thinking of making a Connie brake stay modified to fit the Mean Streak caliper bracket, bolted to the same spot as the Connie brake stay. Do you think this would work? Also, when I install the wheel and caliper bracket, why would you take .09" off of both sides of the caliper bracket for a total of .18", instead of taking .18" off the outside face of the mean Streak caliper bracket? It seems to me that the distance for the caliper to fit the rotor should not change when transferring over the whole Mean Streak wheel and brake assembly, and by taking .09" off the inside face, it would make the caliper offset in by that much on the rotor… am I thinking correctly? If so, the machining would be a simple cut of .18" off the outer face of the bracket, giving the same overall width as the connie wheel and brake caliper bracket. Let me know what you think! I like the way you used the Mean Streak wheel, but was wondering if it would be possible to fab a brake caliper stay, instead of the tube welded to the swing arm? I am a welder, and I was thinking of making a Connie brake stay modified to fit the Mean Streak caliper bracket, bolted to the same spot as the Connie brake stay. Do you think this would work? I made a bracket to fit the OEM caliper on the Mean Streak rotor without machining the wheel. I used the OEM stay arm. When converting to the 15" Eliminator wheel on my C10 I came to an early decision to place the caliper outboard 1/4" due to contact of the black caliper frame with the rotor. So $25 machining charge on the outboard face of the bracket hole common to the axle and two 1/8" washers inboard to maintain the width. One with a good eye could cut/file saving machining cost. Just saying that KISS works sometimes. Have no idea if this is applicable to this threads wheel conversion. Has any one turned down the Mean Streak Rear rotor for the 17" wheel mod? If so do you have any photos of the of the rotor, and how much did you take off the diameter?